Bubble tea shops are popping up all over the place - in malls, on corners, and anywhere else thirsty teens tend to gather. Bubble tea, also called pearl milk tea or boba tea, originated in Taiwan and has become a worldwide sipping - and chewing - phenomenon. But what is bubble tea anyway? Take a cup, plop in a handful of round, gelatinous pearls of tapioca, top it with brewed black or green tea, mix in some milk, sugar, flavouring, and ice. Then shake it all up, and you've got yourself a bubble tea. Oddly enough, the "bubbles" in bubble tea are not those starchy tapioca pearls, which are similar to the little black spheres of cassava you'd find in tapioca pudding. No, the "bubble" comes from the way the drink bubbles up when it is shaken. 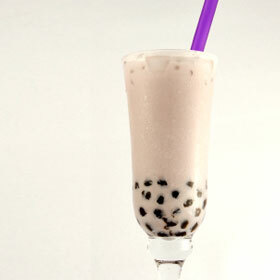 In fact, the first bubble tea didn't contain tapioca pearls at all. Because of the shaking required, most bubble tea shops seal their plastic cups with cellophane and give customers a straw to poke through the top. The size of the straw may vary, depending on the size of the tapioca pearls: smaller pearls, thinner straw. To sip the more common 6-millimetre pearls, you'll need a fatter straw. Adventurous sippers then pop their straw through the top and enjoy - or not. Some liken the sensory experience of drinking bubble tea with tapioca pearls to drinking a smoothie full of gummy bears. The tapioca pearls lend a texture to drinking that some just can't get used to (it is odd to have to chew a beverage). Whether or not that sounds appetizing to you is, of course, a matter of personal taste. Some people develop a full-blown bubble tea habit, downing the drinks day after day, especially during warmer seasons. And with a wide range of flavours - red bean, avocado, taro root, coconut, guava, ginger, jack fruit, watermelon, mango, lemon, lychee, mocha, sesame, strawberry, the list could go on and on - you could try a new bubble tea everyday. But would that be such a good idea? To get a better idea of bubble tea's nutritional profile, we need to look at the main ingredients. The base of bubble tea is usually black or green tea. Tea is a low-fat, low-calorie beverage rich with cell-supporting antioxidants. Though tea generally contains less caffeine than coffee, it affects everyone differently. Watch out for restlessness, irritability, and disturbed sleep. To add a hint of fruity flavour, bubble tea establishments will sometimes add in a purée of fresh fruit (good!). Unfortunately, many shops go the cost-effective route, using fruit syrups, which can be high in sugar and all the fat and calories that come with it. Milk products add a creamy thickness to bubble tea, but they also add fat and calories and are a pain for people with lactose intolerance. Plain bubble tea has 160 calories. Swirl milk in and it goes up to 230 calories. Ask if a shop can forgo condensed milk in favour of soy milk, low-fat milk, or non-dairy creamers. And sorry to burst your bubble, but tapioca pearls place boba tea's calorie count firmly in the "Yikes!" category. Once you plop pearls into your milky tea, you're looking at over 300 calories - and a lot more sugar! Some estimates claim that just one ounce of tapioca pearls contains 100 calories. Considering that recipes call for 2 to 3 ounces of pearls per cup of tea, you're sucking back some major calories. Still on the bubble about bubble tea? Like other delightfully decadent drinkables - think ice-whipped lattes and mega-sized smoothies - bubble tea is really more of a meal or a dessert than a beverage to quench your thirst. Consider bubble tea one of those indulgences to savour once in a while, when you want something cool, creamy, fruity - and just a little bit chewy!